Once the first fitting was complete I permanently stitched the side seams, unpicked and resewed the side back seams taking the jacket in at the hip area. To add a little ease in the waist rather than adjusting the vertical seams I simply released the back dart. This seems to have given just enough extra ease in the waist adding maybe half an inch at the waist itself (good job I did not cut the darts, as proposed in the notes). 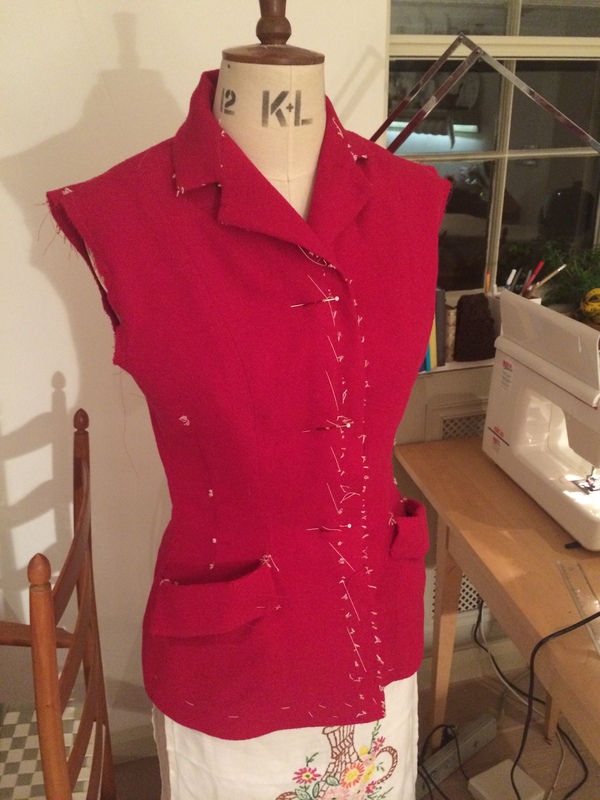 However in the final jacket I want these back darts so I will probably add wider seams in the waist area and create the half-inch overall by very slightly coming inside the sewing line at the waist on the five side and back seams. For the hem I used crin (horsehair braid). This is attached one and a half inches from the bottom of the jacket to ensure the hem has a nice firm finish. This jacket has a convertible collar. The collar is just and under collar and upper collar, with the undercollar and its interfacing cut on the cross in two pieces and joined, with the upper collar cut in one piece (on fold) on the straight grain. I attached the joined bias organdie interfacing to the bias undercollar with pad stitching, creating a satisfying roll. When this is pressed and sewn to the garment it produces a lively roll. I find it rather magical, how a piece of flat fabric becomes so alive with the bias cut plus the pad stitching. Although this is a convertible collar rather than a traditional tailored one, and the pad stitching is restricted to this one little undercollar, I so enjoyed making it. This is definitely one of my most favourite parts of tailoring and why I come back to making and wearing jackets all the time. Next I turned to the sleeves. I love it that older patterns invariably have a two piece sleeve with lots of shaping in it. 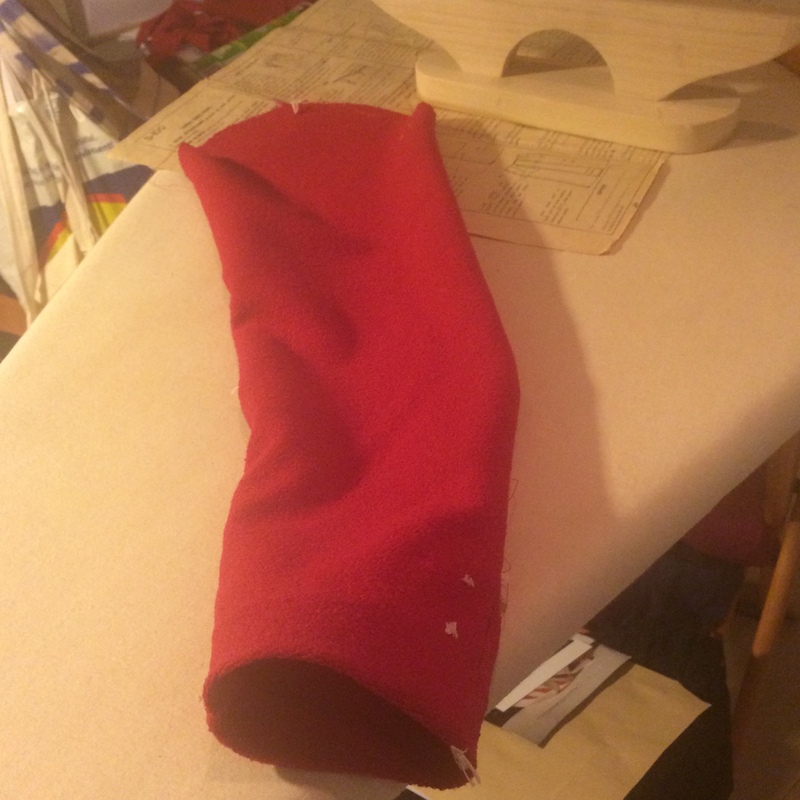 In this photograph you can see how the sleeve has a distinct curve in it, to accommodate the elbow. The two pieces, plus ease, create this shape.This one has ease on both the front and back seams and a nice little button extension without button holes. On the final version I think I will make button holes too. Can also see how the crin holds the hem in place, and the tailors tacks for the sleeve buttons? Inserting the sleeve requires putting this tube into the arm hole so that the fullness is arranged at the point it is needed. This pattern (although this is very uncommon in patterns from the 1940s) suggests a gathering stitch. This is not something I would do unless I was making a gathered sleeve. I always work the cloth in my fingers, using the back of my hand as a curved surface to pin baste the excess fabric into the jacket. I love doing this. Once it is nicely distributed I baste the sleeves and try them on. I regard to process as one of the most essential to creating a well-fitting jacket. Once the sleeves are inserted we will add shoulder pads. This jacket was designed to have them, and I find they give a nice shape to the shoulders. 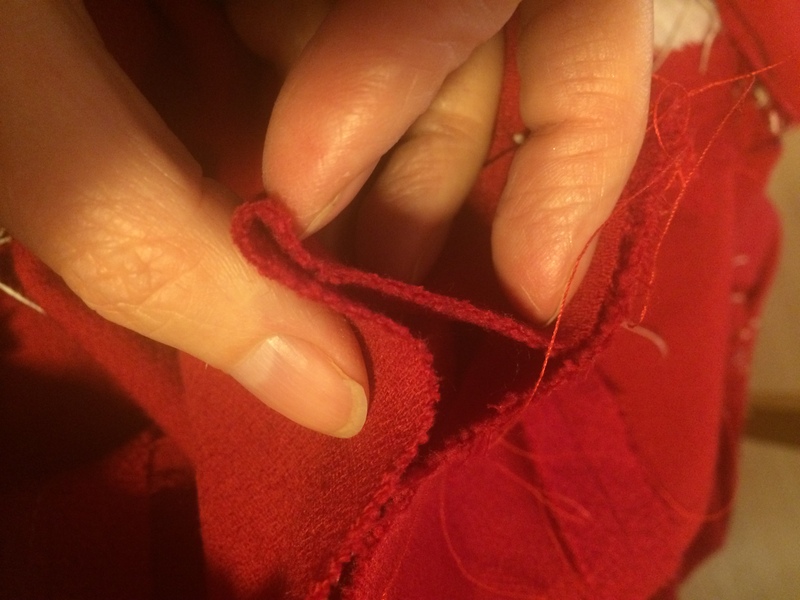 The armhole is cut just a little larger to accommodate them, and they also help fill out the area in the front chest where there is a little indentation. 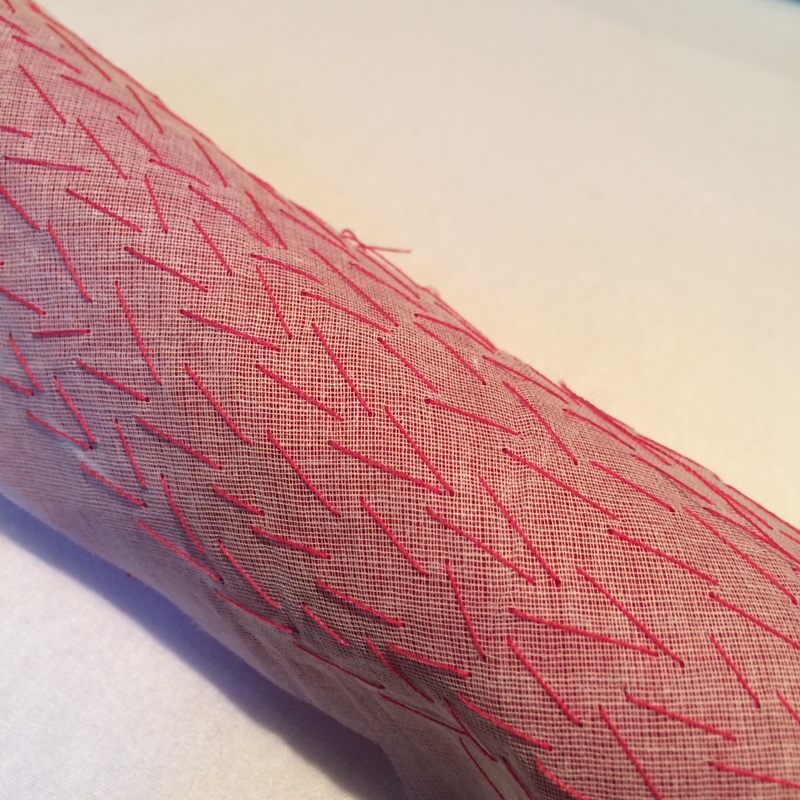 I also often use sleeve head wadding too, just to give the sleeve head a little support. 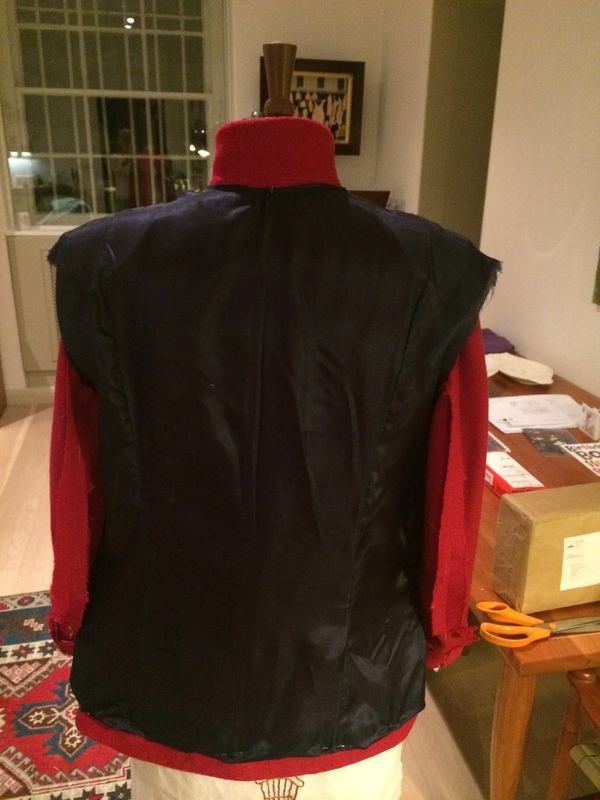 In fact because this fabric has quite a lot of nylon in it, it is not ideal for tailoring and it needs more support than the final version of the jacket (in a heavier, pure wool) will need. I finished the hems but folding over the crin and attaching to it. I completed the button holes by cutting into and fixing the facing. I found some nice shell buttons at McCulloch and Wallis. Like most natural products (leather, wood, horn, etc) shell often has a natural variation in colour. I like this look as it makes the buttons more “lively” and it ensures that the buttons blend with the light and shadows on the jacket, and avoids the need for a perfect match. I actually chose plum coloured buttons originally but when we opened the tubes we found they were navy and the buttons I had chosen were just faded ones. That was a shame, so I settled for red. It is only a toile, after all. In terms of lining I bought some cheap £5 a metre silk – it’s very light weight and I will not use it again. I normally pay twice that for lining silk and this one is just too flimsy to do the job. It might be OK for lining a blouse but it was not much fun to work with. I got navy (it was that, or black) and I think that is nice and smart. But when I do the proper job I will use a heavy satin lining I think – probably one I can paint on, or tie dye. Thanks so much for the detail. I’m taking notes. It’s going to be a fabulous jacket.